nuts bolts and washers included ! 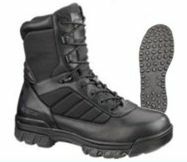 Works with SD, GP, GPX machines, also the Gold Monster and Equinox if you drill additional holes to mount arm cuff cover and the control head. Larger coils pick up the stock upper metal rod and lower your detector’s sensitivity; you need Doc’s NO METAL Upper Carbon Fiber rod. Larger coils mean more weight, you can compensate for this by using Doc’s extremely lite upper Carbon Fiber rod. Larger coils cause more stress on the lower rods. Doc’s lower rods have a specifically designed heavy duty head design to handle the extra stress of the side to side movement of larger coils. Larger coils can weaken the glued joints of the heads of your lower fiber glass rods. Doc uses Gorilla Glue® on all parts. The heads are not only glued on, they are then secured with a fiberglass pin that is glued in place and passes through the fiberglass rod, the head, and the internal solid fiberglass rod reinforcement. Larger coils throw an enormous magnetic field and have the ability to pick up metallic objects on your person. It is important that you get rid of all surplus metal and use longer lower rods to move the coil farther away from your body, that is why Doc’s lower rods are 28 inch as our standard length. 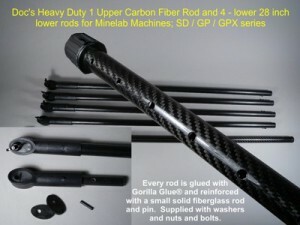 1 – Carbon Fiber Heavy Duty super lite Upper rod. Nuts, Bolt and washers for lower rods included. Having a lower rod on each of your coils is the easy way to change coils quickly. 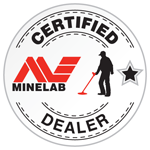 Our upper and lower rods are compatible with other Minelab rods and all coils.